Sharewell now offers Lo Torque Hole Opener Cutters to match the formation hardness of your bore. The Lo Torque Tungsten Carbide Cutter types now range from medium to extremely hard rock formations. Close attention to insert material composition of gage, inner row and base areas of the cutters optimizes their performance in the wide range of rock conditions encountered in horizontal drilling. LT2 2.5" 16 24" 2 IF B x P 3 6"
LT4 4.5" 160 37.5" 2 7/8 IF B x P 3 8" 10" 12"
LT6 6.5" 304 44" 3 1/2 IF B x P 3 12" 14" 16"
LT8 8.5" 628 48.5" 4 1/2 IF B x P 3 16" 18" 20" 22" 24"
LT16 16.5" 1,194 48.5" 7 5/8 REG B x P 3 24" 26" 28" 30" 32"
LT16-4 16.5" 1,252 48.5" 7 5/8 REG B x P 4 24" 26" 28" 30" 32"
LTX10 10.5" 850 61" 6 5/8 REG 3 22" 24" 26" 28"
LTX18 18.5" 1,915 58" 7 5/8 REG 3 30" 32" 34" 36"
LTX18-4 18.5" 1,960 58" 7 5/8 REG 4 30" 32" 34" 36"
LTX24-5 24.5" 2,055 58" 7 5/8 REG 5 36" 38" 40" 42"
LTX30-5 30.5" 2,570 58" 7 5/8 REG 5 42" 44" 46" 48"
LTX36-5 38" 3,175 58" 7 5/8 REG 5 48" 50" 52" 54"
LTX42-5 44" 3,345 58" 7 5/8 REG 5 54" 56" 58" 60"
LTX42-6 44" 3,390 58" 7 5/8 REG 6 54" 56" 58" 60"
LTX48-6 50" 3,900 58" 7 5/8 REG 6 60" 62" 64" 66"
LTX48-7 50" 3,955 58" 7 5/8 REG 7 60" 62" 64" 66"
LTX54-7 56" 4,250 58" 7 5/8 REG 7 66" 68" 70" 72"
Lo-Torque Hole Opener Cutters to match the formation hardness of your bore. The Lo-Torque Tungsten Carbide Cutter types now range from medium to extremely hard rock formations. 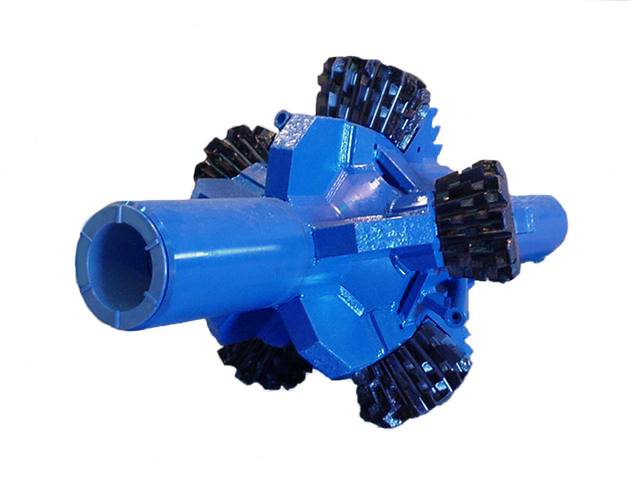 Close attention to insert material composition of gage, inner row and base areas of the cutters optimizes their performance in the wide range of rock conditions encountered in horizontal drilling.